Families of victims have welcomed the development. A 66-YEAR-OLD man has been arrested by detectives investigating the events of Bloody Sunday in Derry in 1972. 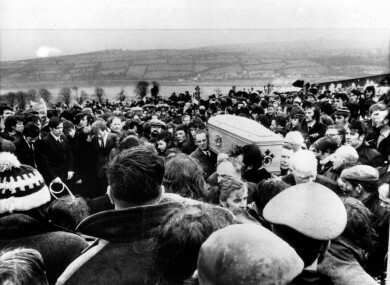 Thirteen Catholic civil rights marchers were shot dead by British soldiers on 30 January 1972. Several more were injured and a 14th person died four months later from his injuries. The Police Service of Northern Ireland (PSNI) today confirmed a 66-year-old man was arrested in Antrim. It is understood that the man is a former member of the British Parachute Regiment. The suspect, who is the first person to be arrested as part of the murder investigation, is being interviewed at a police station in Belfast. The officer leading the investigation, Detective Chief Inspector Ian Harrison, said today’s arrest marked “a new phase in the overall investigation which would continue for some time”. A police source told AFP the ex-soldier was being questioned by detectives investigating the murders of William Nash, 19, John Young, 17, and Michael McDaid, 20, who were shot and killed at a rubble barricade. At the start of this year the investigation into the events of Bloody Sunday was reopened. A team of 12 detectives, led by Inspector Harrison, has been working on it. A 12-year inquiry found the killings that day were “unjustified and unjustifiable” and family members of those who were murdered have said they wanted police to prioritise the arrest of soldiers. Today Peter Madden, who represents most of the families of the victims, said this is a “very welcome development”. “In the event that criminal charges follow, those charged must face public trial and will lose their anonymity,” he said. British media reports said the man arrested was also being questioned over the attempted murder of Nash’s father Alexander, who was shot in the arm and body while trying to save his son. The British inquiry said it was possible that one of two soldiers could have shot Alexander, but there was insufficient evidence to be sure. The 2010 probe also claimed that soldiers put forward false accounts of the incidents to justify their firing. With reporting from AFP. First published at 11.25pm. Email “66-year-old former British soldier arrested over Bloody Sunday shootings”. Feedback on “66-year-old former British soldier arrested over Bloody Sunday shootings”.